Access doors are nearly invisible to the occupants of a building. But they’re indispensable to those who maintain it. A quality-built access door or access panel can be the difference between a simple repair and an expensive one that requires removing part of a wall, floor, or ceiling. Because access doors are used to let us into everything from electrical systems to plumbing, security equipment and even roofs, doors come in a variety of sizes and materials for use in different applications. Can I get Local Access Doors in the Salt Lake City Area? Yes! Williams Brothers is one of the leading manufacturers of premium access doors and even fire rated access doors. Their doors and panels are made to the highest specification rate and manfuctured in the United States. As their exclusive distributor, Cannon Sales stocks several of the most popular Williams Brothers access door sizes in our warehouse just north of Salt Lake City, Utah. But we aren’t limited to what’s in stock. We can also order any size and type of steel door and fire rated door needed for your project. Call (801) 299-0800 for a free quote or for help finding the right access doors for your needs. Do I need an Access Door, an Access Panel, or an Access Hatch? Access panels and doors are terms that both refer to the metal or plastic doors used in walls and ceilings. A specialists like an electrician, plumber, or HVAC worker uses them to let their hands reach the system they need to repair or maintain. However, access hatches allow the entire worker to safely enter a closed area. 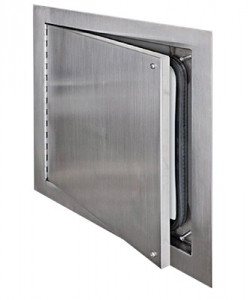 Manufacturers like Williams Brothers design access hatches for use in roofs and floors. Because they often access exteriors, they are made with the heaviest-duty materials and may include weather protection, locks, and other safety features. What Should I Know Before Choosing an Access Door? The most commonly used access doors are made from steel but come in a variety of weights and finishes. If your access door will be used often or located in a prominent area, consider one constructed of heavy-gauge steel. A larger flange, a weather resistant gasket, and baked enamel finish are also signs of quality. Higher-end doors features full-length, concealed hinges for years of service without warping and bending. 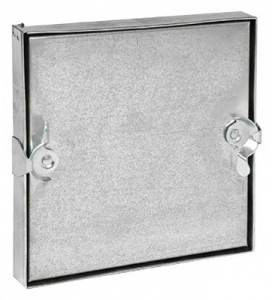 For some projects, light-duty access panels with pin hinges and smaller flanges may be acceptable. Access doors are made from many materials and each material change affects the appearance. 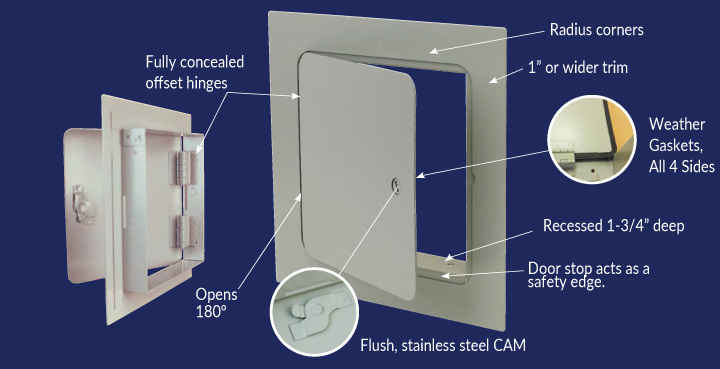 Stainless steal, gypsum board, aluminum, plastic and even plaster bead doors all have their purposes depending on where you’ll place the access panel. Builders achieve the best architectural finish with aluminum or cold-rolled steel doors. Look for a flange welded to the door’s frame on all sides and laser-cut from a single piece of steel. This construction style not only provides the most strength, but it also offers a clean look without mitered corners. Baked finishes and quality hinges will also help the access panel resist warping and scratching for years to come. As with any construction product, access doors are made for a variety of applications but should be of the highest quality for the use you have planned. High-impact ABS plastic access panels may be sufficient for some light-commercial and residential applications. Stainless steel construction is often required for industrial use. Where Should I Use an Access Door? You can mount many metal access doors in all kinds of materials such as drywall, wood, masonry, and concrete. However, certain applications require specialty doors. Code requires these doors whenever access is needed in a fire-rated wall. These access doors are steel and can fit in drywall, brick, concrete and more. If your door will be in close proximity to plumbing or HVAC systems, you may want it to be airtight and watertight. This type of door is a requirement for many operating rooms, hospital uses, laboratories, clean rooms, and more. Doors and hatches that connect a building with the outside world require insulation and weather protection, so exterior access doors are the standard. But when an access door must allow an entire person into a basement or onto a roof, this requires additional features for safety and security. Access hatches often include drainage troughs, caution markings, locks, gaskets, and include the most durable finish materials. 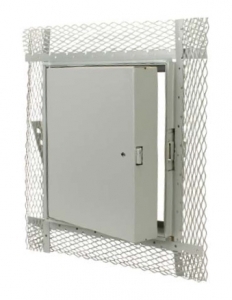 Constructed of galvanized steel, this type of access door is created specifically for HVAC applications and make making it simple to reach dampers and other components. Look for upgraded features like knock-over edges, locks, gaskets and viewports. Cannon Sales provides a wide variety access doors for every use, all built to the highest specification rate. We have fifty years of experience serving the construction industry and can help you select the right access doors for your project. Williams Brothers brand access doors and panels are designed to provide efficient and secure service access to critical areas in walls and ceilings. They offer a wide range of commercial, industrial, institutional and residential applications. Perfect for both new and retrofit building projects, Williams Brothers access doors allow easy access to mechanical, electrical, plumbing and other building systems.